The Alake of Egbaland, Oba Michael Gbadebo, has advised former President Olusegun Obasanjo to stop attacking President Muhammadu Buhari as he (Obasanjo) clocks 82. The monarch said he had never been comfortable whenever Obasanjo attacked Buhari, urging him to sheathe his sword. Alake gave the advice in his goodwill message during Obasanjo’s 82nd birthday celebration at the Olusegun Obasanjo Presidential Library in Abeokuta. 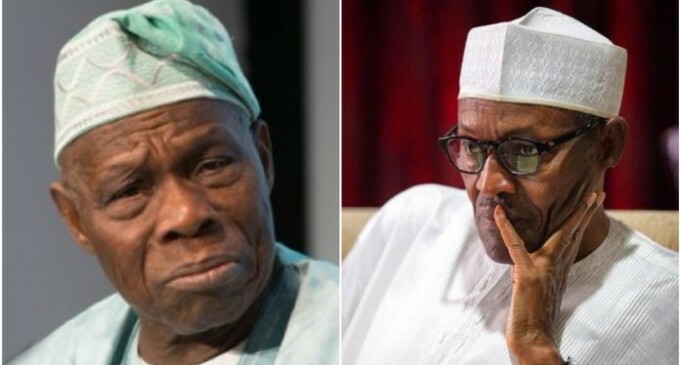 Alake, who served as a military officer during the military administration of Buhari between 1983 and 1985, said he had always told Obasanjo to leave his boss alone. According to the monarch, Obasanjo has fought for the peace of the country more than anyone and has won many battles for Nigeria. “At 82, baba is still fighting; please, fight less and be a father to everybody. “You need to rest, fight less and take a position of a consultant at your new age. “At 82 years, I think you should keep your sword more rather than use it always,” he said. But Obasanjo, while acknowledging the goodwill messages from friends, responded to Alake’s plea. Obasanjo, who supported his former deputy, Atiku Abubakar, of the Peoples Democratic Party, was one of Buhari’s fiercest critics during the electioneering. He explained that the issues between him and Buhari were not personal. He said, “Governance is not a family affair and democracy involves criticism and considering all the sides to an issue. “There is nothing personal between President Buhari and I.